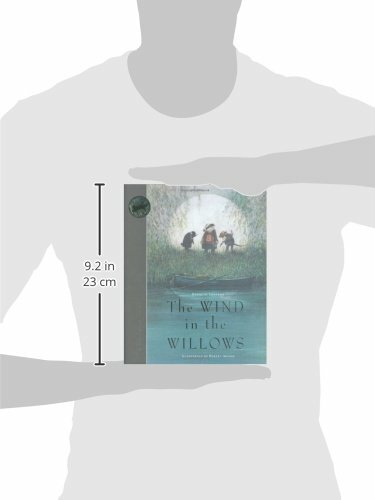 The vexed question of illustrating The Wind in the Willows – a hundred years old last year – was touched on in the ‘Classics in Short’ column in BfK 152. Robert Ingpen, illustrator of this edition, has devoted considerable artistry to his text. And ‘devoted’ is the word, for he has taken Grahame’s wish to heart – ‘I love these little people. Be kind to them’ – and every brush-stroke of his beautifully-conceived illustrations is a tribute to what is going on in the story. There are grand double-page panoramic spreads at the start of each chapter (the curving stream for ‘The River Bank’, the cosy interior of ‘Dulce Domum’), there are full-page plates (Turner’s Venice looms up, entirely appropriately, in ‘The Gates of Dawn’) and there are a host of vignettes in the text which perfectly catch the atmosphere of the story as it progresses. And it is the whole story too, unlike its only competitor in terms of artistry – Inga Moore’s version for Walker Books – which ornaments an abridged text. It makes for a hefty volume, which may need a lectern for bed-time reading, but I suppose that that’s what ‘global publishing’ does for you.